The Institute of Construction Management on 23 November 2018 launched the National CDM Competence Registry™® in the Skills Hub at London Build 2018 in London Olympia [reported in an earlier blog article]- in this article David Jones explores issues around the uncertain competence of those who may currently assess FIRE RISKS in buildings and the real and certain danger nightmare scenario for those who have to rely upon questionably defective assessments! One hundred and twenty-eight councils responded to Freedom of Information requests about their fire risk assessors, with 46 saying they had used at least one unregistered assessor since 2010. Of these, 23 said that none of the assessors they had used since 2010 were registered. A further 56 did not know whether their assessors were registered, and only 26 said all their assessors were registered. Combustion is when fuel reacts with oxygen to release heat energy. Combustion can be slow or fast depending on the amount of oxygen available. Combustion that results in a flame is very fast and is called burning. Combustion can only occur between gases. Fuels can be solids, liquids or gases. During the chemical reaction that produces fire, fuel is heated to such an extent that (if not already a gas) it releases gases from its surface. Only gases can react in combustion. Gases are made up of molecules (groups of atoms). 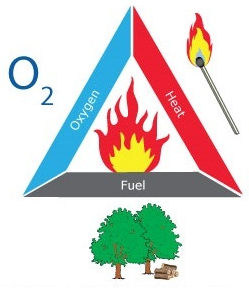 When these gases are hot enough, the molecules in the gases break apart and fragments of molecules rejoin with oxygen from the air to make new product molecules – water molecules (H2O) and carbon dioxide molecules (CO2) – and other products if burning is not complete. Oddly there is no legislative requirement for the fire risk assessment to be carried out by a competent person. It is said that this is to avoid an implication that every duty holder under the legislation needs to employ the services of a fire safety specialist, such as a consultant, to carry out their fire risk assessment. For small, simple premises, it is often the duty holder that carries out the fire risk assessment. Arguably, it is reasonable to assume, in these premises, the duty holder is probably the best person to do so because of their intimate knowledge of the premises and the activities therein - however, even those duty holders must have a sufficient level of understanding to be able to safely undertake such task themselves! Guidance to support those wishing to carry out the fire risk assessment themselves has been made available by the Government. The Fire Protection Association has published its fire risk assessment guidance booklet which outlines the principal duties of the responsible person/dutyholder under existing UK fire legislation. It guides through the fire risk assessment process, offering examples of potential sources of ignition, the people at risk, and how to assess existing fire safety measures. In most circumstances it will be necessary for whoever is preparing the fire risk assessment to record the findings of the risk assessment for which a template has also been made available - details are on the booklet which can be accessed by CLICKING HERE. However, for many premises, the duty holder seeks the services of an external consultant (‘a fire risk assessor’). In the case of larger, more complex or high risk premises, this is often appropriate, as the task might well be beyond the ability of the duty holder. Some members of the business community and sector have suggested that it would be helpful for those who want to use the services of a commercial fire risk assessor to be able to access information on those with an appropriate level of competency in fire risk assessment to help them comply with the legislation. There has also been growing concern regarding the competence of those who provide these fire risk assessments on a commercial basis (i.e. for a fee). Data from the English Fire and Rescue Service suggests that the main compliance failure leading to enforcement action is a failure by duty holders to carry out a suitable and sufficient fire risk assessment. This is coupled with the emergence of inadequate fire risk assessments for premises that have suffered multiple fatality fires. As a result of these concerns, the Fire Risk Assessment Competency Council, which comprises a broad group of relevant stakeholders (listed as participants), emerged from the fire sector with the encouragement of Government. Its objective has been to establish agreed, industry-wide, criteria against which the competence of a fire risk assessor can be judged. It is generally accepted a person is regarded as competent where they have sufficient training and experience or knowledge and other expert qualities to enable them to properly implement and undertake their role. c) A willingness and ability to supplement existing experience and knowledge, when necessary, by being able to realise inadequacies and obtain external help, support and advice. For such premises, there will be a need for the specific applied knowledge and skills of an appropriately qualified specialist. In such cases, evidence of specialist training and experience, or membership of a professional body, or certification by a third party certification body, may assist in demonstrating competence. Competence does not necessarily depend on the possession of specific qualifications, although such qualifications might contribute to the demonstration of competence and in the ICM's registration process. In context, knowledge can be obtained by academic study, training, working alongside others, short courses, continuing professional development or any combination of these. Education is likely to involve formal education of a relatively academic nature, often culminating in a qualification. Training involves training of a practical nature, often given on the job. It is not implied that education, training and experience in the principles of fire safety need each be extensive, provided that the combination of each results in adequate knowledge. Moreover, a high level in respect of any one of these might compensate for a lower level in another. It is essential that the level of competence be sufficient to allow the fire risk assessor to identify correctly the significant risks (especially combined risks) and to draw up a list of appropriate actions to address them. London Fire Brigade believes that following a few simple steps often can ensure a person has a suitable and sufficient risk assessment and that people will be better protected from fire. Employers or occupiers or have some managerial responsibility over any non-domestic premises, then you will are probably legally obliged – as per the requirements of the Regulatory Reform (Fire Safety) Order 2005 – to conduct a fire-risk assessment. Even if you do appoint an external fire-risk assessor you, as the responsible person, can still be held accountable if mistakes are made. Although you are not expected to be an expert in fire safety, you should make reasonable checks to ensure that they are adequately qualified and experienced.